Kuala Lumpur, 3 January 2017 – Medical students from eleven colleges and universities participated in the annual inter-varsity IMU Art Competition that was held recently at the International Medical University (IMU) campus. Upholding the theme, “Determination”, the art competition saw 19 unique and eye-opening entries competing for 2016’s top honours. In the end, it was Sim Li Mei from Taylor’s University who clinched the grand prize of RM3,000 with her piece titled, ‘Willpower’. The art piece depicted a human tower built upon family support, followed by nurses, doctors and surgeons in providing hope to heal the patient. “Art teaches me to see things in a wider scope and be more conscious with my surroundings. In my opinion, the competition has challenged us to use art to express our thoughts and feelings on the given theme and taught us to look at healing and health from a different perspective,” said Sim Li Mei. A special prize was presented to Michele Fernandez A/P Joseph Hath from IMU for her artwork entitled ‘The Sculptor’, which portrayed that ‘impossible is nothing’, as long as we are determined to bring forth waves of change especially for the betterment of our health. Ghavinassh A/L Kanabathy from Perdana University also took home a special prize for her piece entitled ‘Epitome of Determination’, depicting a colony of ants lifting the stethoscope that represents the determination and passion of all healthcare professionals towards upholding the quality of the ever-evolving healthcare system. A third recipient of the special prize was Tung Yu Zhen from University of Malaya, for her piece entitled ‘I might limp, but never Wimp’, portraying that true limitations come not from an ill body but a chained mind. 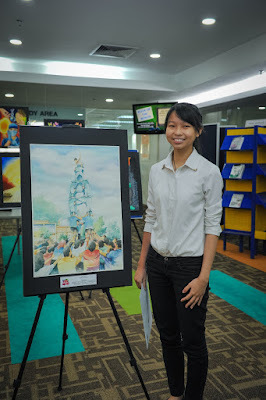 “The art competition encourages young Malaysians to visualise their perspective of health. The expression of the year’s theme, ‘Determination’, in relation to health reveals insightful views and perspectives for us to contemplate upon, especially as we train and groom future healthcare professionals. We look forward to more students participating in this annual competition in the coming years,” said Ms. Sheba D. Mani, Project Leader of the IMU Festival of the Arts. 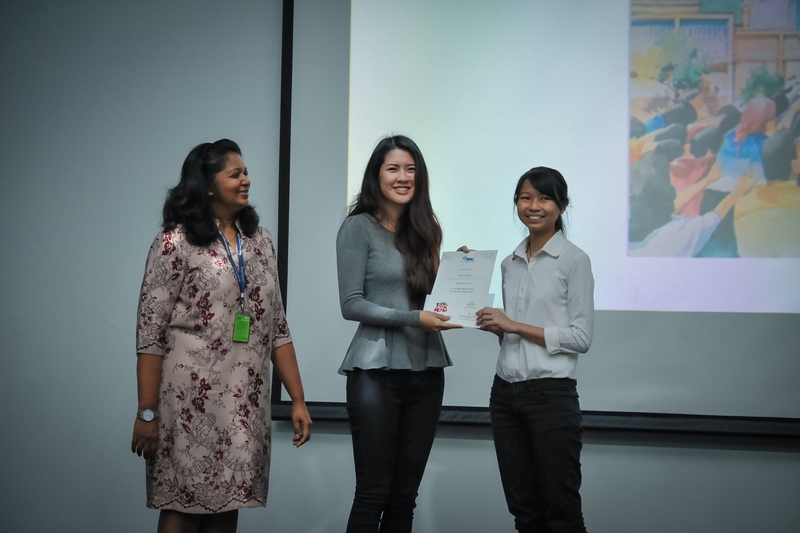 Sim Li Mei (right) receiving the grand prize from Dr Caryn Koh, one of the judges of the art competition (middle). Looking on is Ms. Sheba D. Mani, Project Leader of the IMU Festival of the Arts (left). The entries were judged by Harris Rashid and Dr. Caryn Koh, two young established Malaysian artists. Harris Rashid was involved in group and solo exhibitions such as Beauty in the Beast, HUMANIMAL, VICE VERSA and many more. 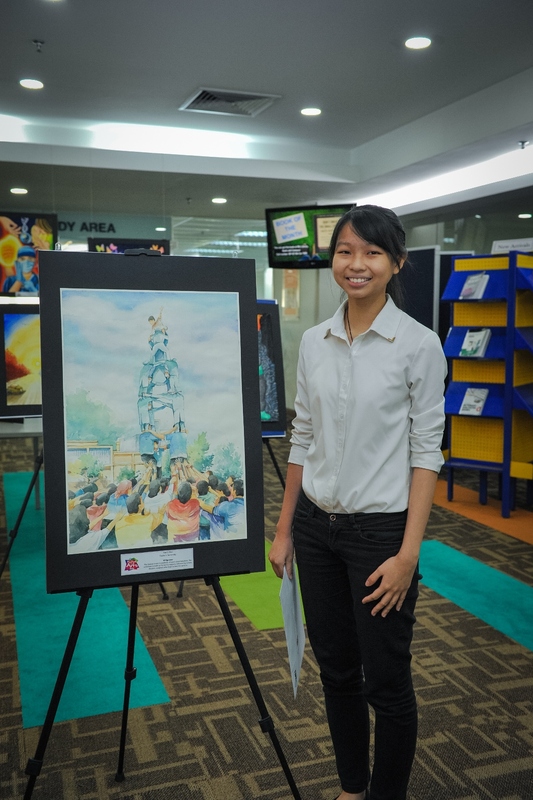 Dr. Caryn Koh, an IMU alumnus, is notably recognised for her #sekolahseries illustrations and was shortlisted for ‘Your Art, Your Story’ Nando’s Art Initiative 2016 and won the second place in Printmaking Category, Tanjong Heritage Competition 2016. “It is important to encourage arts as it's a form of expression and explores the possibilities of unlocking our own potential. It also helps with critical thinking and being able to think outside the box when faced with challenges in our course or workplace in the future. 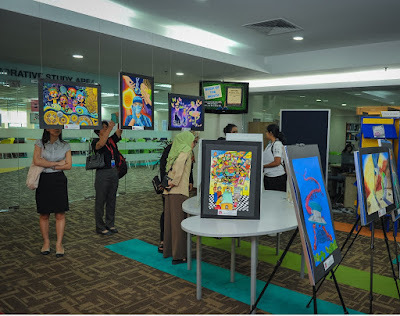 IMU has done amazing efforts thus far in promoting the arts and humanities in their courses, now it is about taking it a step further and bringing forth more contentious issues that could spark more interest and conversations in art and healthcare,” said Dr. Caryn Koh. Organised by the IMU Festivals of the Arts under the leadership of the Department of Language, Communication and Culture, this year’s entries came from I.M Sechenov Moscow Medical Academy, IPG Kampus Sultan Abdul Halim, KDU University College Penang, Multimedia University Malaysia (Cyberjaya), Perdana Royal College of Surgeons in Ireland, Perdana University, Taylor’s University, Universiti Teknologi MARA (UITM), University of Malaya, UNIKL Royal College of Medicine Perak (RCMP) and IMU.